This slide gives a year-on-year comparison of revenue by segment for the first quarter. 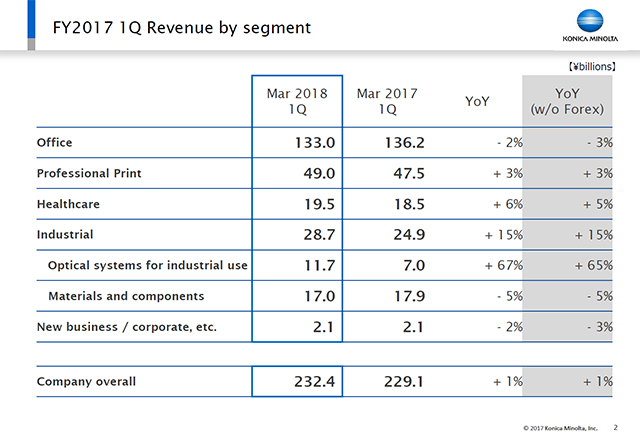 The Office Business, and Materials and components, saw revenue fall by 2% and 5% respectively, but the Professional Print Business and Healthcare Business posted higher revenue and in particular Optical Systems for Industrial Use recorded a significant increase of 67%. This is the first accounting period since the start of the new “SHINKA 2019” Medium Term Business Plan, and the names and content of some of the business segments reported up until FY2016 have been changed. We have included a comparison table in the Appendix for the changes in segments, to which you are asked to refer.